Heading Tag is very important for a Website or Blogger Blog to increase SEO. Heading tags helps Search Engine to recognize what is important to your Blogger Blog. Heading tag six types they are (H1 to H6). H1 tag is more important from other Heading tags. Search Engine give more priority on H1 tag for website and Blogger then others H2, H3, H4, H5, H6. So, we should change our Blogger post title with H1 tag. We know, by default Blogger post title is in H3 tag and H1 tag is used for the site title. Without Blogger blog other CMS(Content Management System) is fully customize with H1 tag.So, do not need to optimize CMS or others but you need to optimize Blogger.Today i am going to share how to customize your Blogger post title. 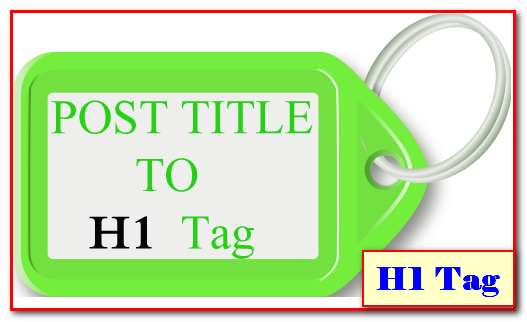 How To Customize Blogger Post Title with H1 Tag. Step 1: Log into your Blogger Dashboard . Click on Template then click Edit HTML. Must backup your Template before customize. Now click into code area and press Ctrl+F to open search box. Now find bellow code( In Blogger Template this code is used for Post Title Tag). Now change all H3 tag with H1. Step 2: Again find bellow code like before(This Code is Used Site Title Tag in Blogger Blog). Now change all H1 tag with H2 tag. I again said if you are a Blogger Template user you must change your post title with H1 tag and change site title with H2 tag cause it is more essential for SEO. When search engine search a result then they find H1 tag first. So, if you use your post title with H1 tag then you can easily optimize your post in search engine.Hopefully you can done this successfully.If you experience some trouble please comment bellow.I will try to solve it.